Could there be a better combination than chicks in chainmail bikinis and zombies? We think not, especially when we've featured both games in Co-Op Classics! Brain eating undead and magic wielding warrior women are both headed to the Wii this week, via the Virtual Console service. 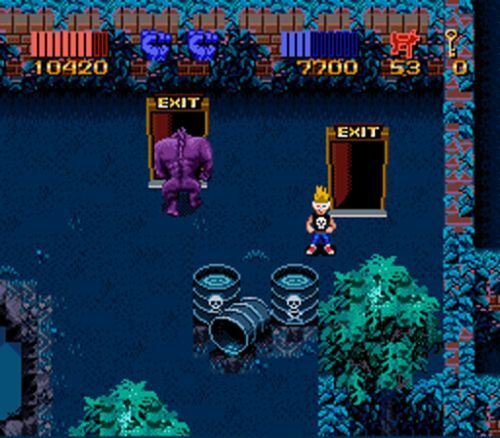 Zombies Ate My Neighbors is a fine 16 bit home console gem. You and a friend can control a spiky haired, 3D glasses wearing boy, or a young lady in short shorts as they, you guessed it, save their neighbors from zombies. The gameplay is pretty simple, but the style of the game is quite charming, and it's well worth the 800 Wii Points. Golden Axe is more well known, and for good reason. It's one of the first and best brawlers from the height of the arcade era. Swords, sorcery, dwarves, and the aforementioned chainmail bikinis all make for a good time with a friend. The release is based on the actual arcade version, and will set you back 900 Wii points. Page created in 1.1087 seconds.